I Had My Brain Monitored While Looking at Gory Pictures. For Science! 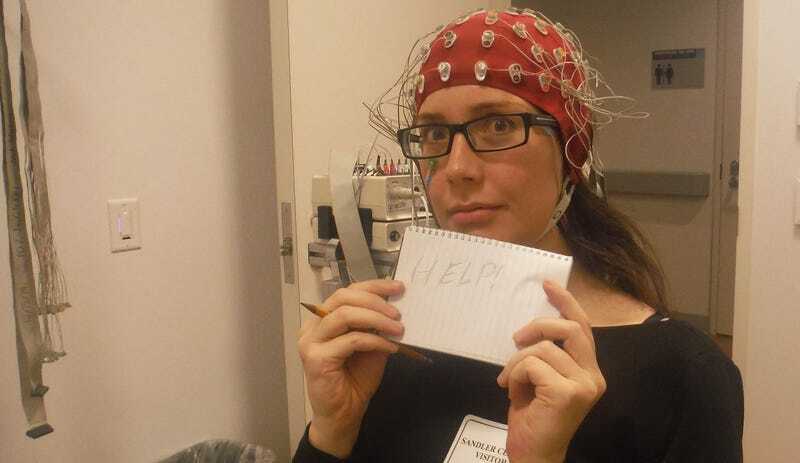 I was a test subject for a real, no-foolin’ neuroscience study with electrodes strapped to my head and everything. It was surprisingly pleasant—until they started showing me pictures of severed feet. Alan Leggitt, a friend of mine and a PhD candidate, has spent the last few years studying, training, organizing, and occasionally having monkey poop thrown at him to better understand the human brain. When I learned that I could see what he does, participate in a study, and there would be no poop involved, I jumped at the chance. Alan’s project is called EmoWorm, which is short for Emotion & Working Memory. He’s hoping that one day his work can help people with PTSD. For now, he’s seeing how pictures that evoke strong negative feelings affect memory. I’ve been told ahead of time that, as part of the study, I’ll be looking at pictures that I’ll find gory and extremely unpleasant. Braced, I walk into the Gazzaley Lab, and Alan comes out to greet me. He looks so innocent, doesn’t he? The act stays in place as he walks me through the legal details. I can leave at any time, and, “This isn’t the Stanford Prison Experiment.” Good to know. I’ll be paid for my time even if I leave early. (Suckers!) And, he says, if I feel overwhelmed, sick, or panicked by the pictures I see, I not only can but should stop the experiment, since a panicked reaction isn’t the kind of data he wants. He’ll be watching me through a video camera. It isn’t recording. It’s just a way to monitor me without him in the room breathing down my neck. He tells me that what I’ll be doing, after I fill out a brief personality questionnaire, is getting a swim-cap full of electrodes stuck to my head. Some of the time, during the experiment, I’ll be simply closing my eyes and letting my mind wander. At other times I’ll be passively looking at pictures. Mostly, though, I’ll be seeing a colored square, then a pause or a picture, and then another colored square. My job is to judge whether or not the square before and after the picture are the same color. This will prove surprisingly hard to do, but I don’t know that yet. I fill out my questionnaire while Alan goes to get the equipment. The questionnaire is 120 items long. Each item is a declarative statement about me that I have to either agree with or disagree with on a scale from one to five. (Sighing, Alan requests, “Please use whole numbers. Don’t put 4 1/2. Yeah, people do that.”) After a while, I get the idea that the questionnaire is trying to trip me up. It repeats questions, phrasing them slightly differently each time. It asks me if I sympathize with people (I don’t), if I find it easy to understand other people’s feelings (No), and if I often understand how other people feel (I said no!). I hear two people coming down the hallway outside. One of them, a young guy, is saying, “Oh, this is sick! They strap all this stuff to your head and then they show you . . . oh.” Two fresh-faced young people in business-casual clothing stop talking when they see me sitting in the room they were walking towards. I wave, and they keep going down the hallway. By the time I finish the questionnaire, Alan is back. And guess what he has. Fortunately, that is for the electrode cap on my head. The swim cap goes on, but to ensure that there’s a good connection between my head and each of the 64 electrodes, he has to inject gel into holes in the cap. He measures me up (57 centimeters around the brain pan), and starts squirting the gel between the cap and my scalp. It’s actually quite pleasant, like getting a head massage, except instead of getting it from a masseuse, you get it from a friendly scientist who tells you that most of the fresh-faced young people in the hallways just talk about Game of Thrones. Finally, the experiment begins. Alan turns off the lights and leaves. I look at the computer monitor. It flashes a colored square, then goes dark except for a small white cross, which I am supposed to focus on between images, then flashes the next colored square. Are the squares the same color? Right away, I do much worse than I expected. It tells me I’m incorrect quite a lot. How hard is it to remember a color? It’s more than my mind can handle. I catch myself taking my eyes off the white cross in between squares, because looking at darkness of the monitor helps me keep the color in my head. Throughout the experiment I find myself doing this, and keep having to remind myself that I’m trying to do the experiment, not “win” it. Which is good, because I would not win. If there’s one thing this experiment teaches me, it’s that I might be slightly colorblind. I’m unfoolable when it comes to spotting magenta, but there apparently are two shades of green that I cannot for the life of me tell apart. As for the images, there’s no way to make light of them. The instructions in front of each of the sets of photographs, whether I’m passively watching them or trying to match the squares before and after them, ask me to try not to blink or flinch. I don’t really feel the need to, but I can see why the instructions are there. The disturbing photos look to be autopsies, medical photos, and crime scene photos. While I have seen photos like them, the photos one after another, even interspersed with innocuous photos like lamps or fans or people walking around, are a real education in all the horrible things that can happen to a human body. While most of the pictures are unpleasant, I find myself least able to ignore the ones where something ambiguous is happening. I wouldn’t say I’m viscerally shocked, but I can’t help thinking things like, “Is that guy dead? Are there two bodies or three? Is that brain or bone or pus or what?” I wonder if I would prefer having more time to study them. While I can’t tell, I’m fairly certain that I am worse at remembering the colors after the gory photos than after the neutral ones. Sometimes, though, I wonder if what I’m seeing is neutral. Is a cracked, dirty doll head neutral? Is a cat with a dead mouse neutral? If that is a mask, I think, then that photo was neutral. If that was someone’s peeled-off face skin, then it wasn’t. Which was it? I don’t know. After the last matching session, Alan comes back in. It’s time to remove the cap and take the electrodes off my face. I’m ready to get up, but he stops me. “You’ve got some great marks on your face from the electrodes, and your hair is pretty gelled up.” He snaps a photo. This is a lab that regularly does EEG tests, so they are well-equipped to deal with this. They have a bathroom with a special sink for washing hair, a supply of towels, and a hair dryer. Since I’ve never owned a hair dryer, this is the most confusing part of the experiment. It takes me two minutes to figure out how to turn it on. It has three switches, and each one has to be in a precise position to get it to work. I will spontaneously combust before that hair dryer does. The experiment is over. Alan comes in one more time to check that I have all my stuff, to pay me for the experiment, and, I think, to make absolutely sure that I’m doing okay. He thanks me. I thank him. I walk out, and decide that I will concentrate on the food pictures that I saw. It helps that I’m hungry, and that I have sweet, sweet lab research money in my pocket. Ah, the rewards of science.